Audio made easy? Yeah…that’s something I need since I have an interest but zero background in it. But … wait a minute … where’s the ‘easy’ part? To be fair, author Ira White does a nice job of explaining the equipment an audio engineer would likely use, in the simplest of terms. But he does also presume that the reader already has a basic background in sound as some basic terms are not define, leaving me scrambling to understand them. They may be basic for the average sound engineer, but for the person interested in getting started in audio…? Not so much. I did get some valuable information here but nearly enough to feel confident to even start to think about going in to some sort of sound engineering. Also… while it might seem to be the obvious direction, this book really focuses on sound engineering for music recording. Recording for audio books is one of the largest growing industries and is in fact why I was interested in this, and it didn’t really address this (other than the basic audio engineering terms). The subtitle is clever (“Or How to be a Sound Engineer Without Really Trying”) but is in fact misleading and definitely not true. Looking or a good book? 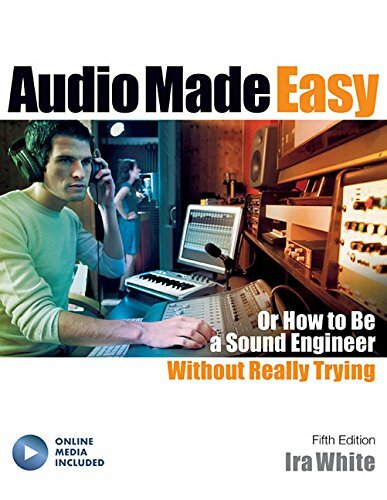 Audio Made Easy (5th Edition) by Ira White is a good primer for audio engineering work, but does expect the reader to come in with a general sound knowledge.